Is it strange to seek out some pho after a long flight? It seems fairly regular for us to want a little bit of comfort food. Duc and I were heading to Hawaii to experience it like a native might since our Hawaiian born-and-raised friend would be back in the area then. We took a Blacklane car to the airport (thanks to them for the complimentary service!) in comfort and style which kicked our trip off to a great start. When we landed on Oahu and had just a handful of hours before our friend would land, we were curious what Vietnamese food on the island would be like. Luckily, our random turn down the street from the airport led us toward a small plaza that had plenty of restaurants to choose from. 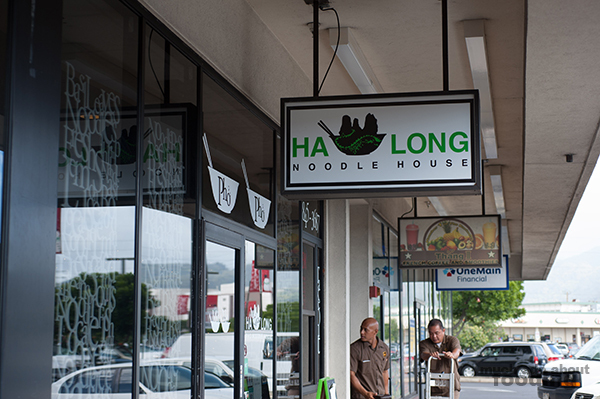 One of them was Ha Long Pho Noodle House, and it had several positive ratings on review sites. Time to check out the Hawaiian Vietnamese food! The first impression when we walked in was how bright and modern the interior looked. Usually the pho restaurants we frequent back home in Orange County are a little outdated and full of non-English speakers. There is practically no service but you are guaranteed some solid food. This eatery looked much newer and was run by younger folks. 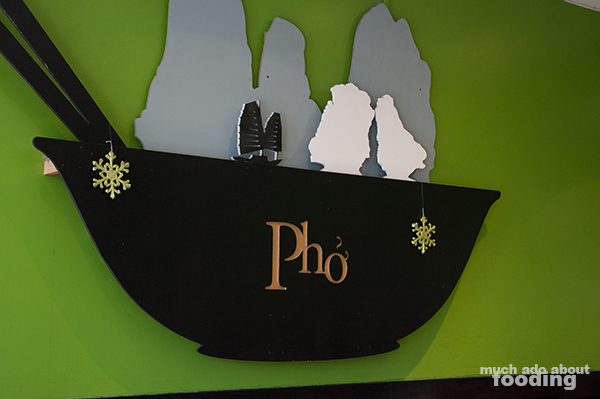 The design was clean and the wall art reminiscent of a hip new bubble tea joint rather than a pho restaurant. 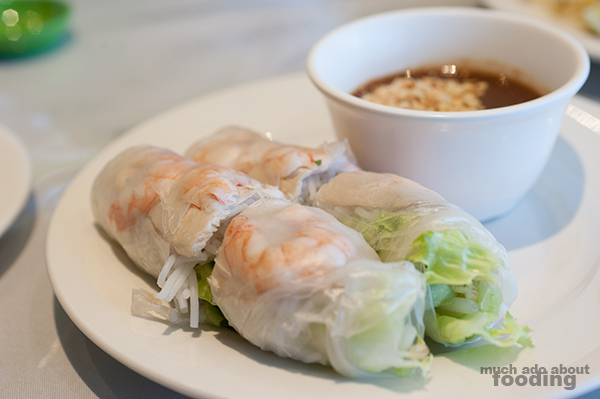 We started with their Fresh Summer Rolls/Gỏi Cuốn ($6.85 - shrimp and pork wrapped in rice paper with vermicelli, mint, lettuce, cucumber and bean sprouts served with peanut sauce) which came out as a plate of two. Fat and hastily wrapped, they looked more like the ones a person makes at home and were stuffed with ingredients that also made me think of homemade bites. We liked how bountiful each roll was but could not justify the cost when a majority of the roll was the vermicelli. 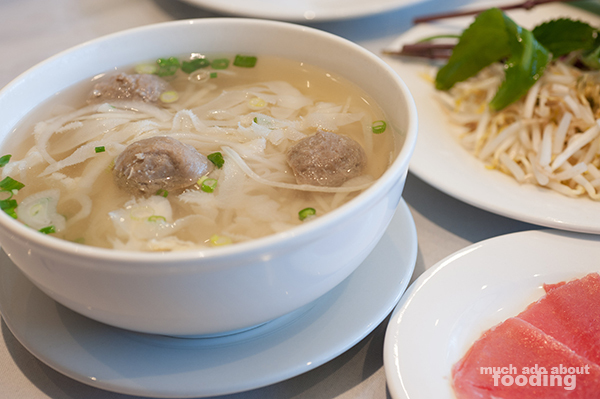 Since we were planning on visiting several places for small bites here and there, we opted to share one bowl of their pho. There are plenty of options that you typically see where you have a base broth plus a selection of meats. Most included a combination of their rare steak and another type of meat. You could also get the all meats version for the same cost as our own choice of 10) Choose your choice of beef ($9.49 - rare steak, beef balls, well done flank, well done brisket, tendon, tripe: limit 3 choices or add additional $1 for more than 3). We went with their rare steak on the side, beef balls, and tripe just to satisfy both of our preferences. The rare steak was very thin, perfect slices for pho, but the portion was slim. There were also only three halves of beef balls (where did the other half of the second one go?) and a few strands of tripe. For nearly $10, the bowl should not have been mostly noodle! We did appreciate how clean the broth looked but then realized that it was that way because it lacked the signature beef bone broth taste. All in all though, it was served hot with choice pieces of meat (what little we had) and noodles at the right texture level so we thought it good for a quick fix. 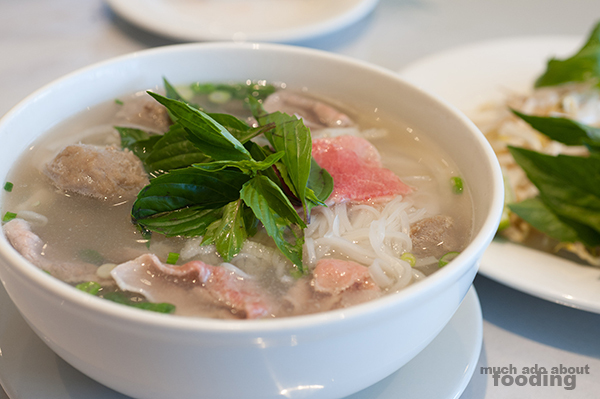 If your standards of pho come from Little Saigon out in Orange County though, you might not be too keen on this version!